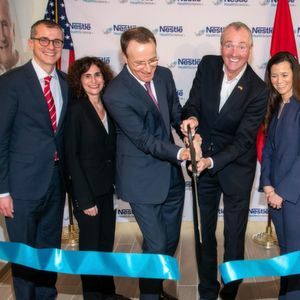 Nestlé Health Science celebrated the inauguration of its new Product Technology Center with a ribbon cutting ceremony at the facility in Bridgewater, USA. The event marks the completion of a three-year, $ 70 million investment to establish a global research and development hub. Bridgewater/USA — The new Product Technology Center in Bridgewater is the lead Product Technology Center for Nestlé Health Science globally, the company announced. The facility is co-located with the US headquarters of the Health Science division, allowing for deep integration between the R&D and commercial sides of the business in their largest market. Home to more than 170 employees, the Bridgewater facility is equipped with advanced capabilities across the R&D lifecycle — from ideation and rapid prototyping to sensory science, production and commercialization. The Product Technology Center also plays a critical role in advancing the company’s efforts to reduce packaging and produce lighter weight products, part of the group’s global ambition to make 100 % of its packaging recyclable or reusable by 2025. The Product Technology Center became fully operational in August with the completion of its pilot plant and is already driving innovation. It recently renovated Boost Kid Essentials to reduce sugar, remove artificial colors and simplify ingredients, was instrumental in the launch of Compleat Organic Blends, a line of nutritionally complete tube-feeding formulas that are organic and non-GMO, and introduced new formulas for Boost and Carnation Breakfast Essentials, providing more protein. These launches are to deliver on consumer demand for simplified formulas, organic alternatives and higher levels of protein.